Last night my family came over to drop my sister off for the night. She’s off school for the summer, and wanted to hang out at my place for a while. She can be a picky eater, so I wanted to make something for dinner I knew she’d eat. I figured pizza would fit the bill. With 4 adults to feed also, I thought I better make two pizzas. I decided to do one more traditional, like what you’d order from any pizza chain; and one like I’ve been making lately with the whole wheat crust. I wanted to dress up the plain pepperoni pizza, so I made it stuffed with cheese around the edge. I knew my family would enjoy that one for sure. I topped the whole wheat crust with fresh vegetables and prosciutto. Scott and I love this combination and I hoped my family would give it a try. Combine 2 cups flour, undissolved yeast, and salt in a large bowl. Stir very warm water and olive oil into flour mixture. Stir in enough remaining flour to make soft dough. Knead on lightly floured surface until smooth and elastic, about 4 to 6 minutes. Cover and let the dough rise for 20 to 40 minutes, depending on your preference for a thin, more dense crust or a thicker crust. Once the crust has risen to your liking, Lightly oil 1 (14-inch) or 2 (12-inch) round pizza pan(s). Shape dough into smooth ball. Divide and roll dough to fit desired pan(s). I prefer to roll mine out on a silicone baking sheet so I can easily move it onto the pizza pan. For the stuffed crust (skip this step for a regular crust): I rolled mine just a bit bigger than my pan and dotted with little mozzarella pearls. Fold dough over the cheese and pinch together to seal. 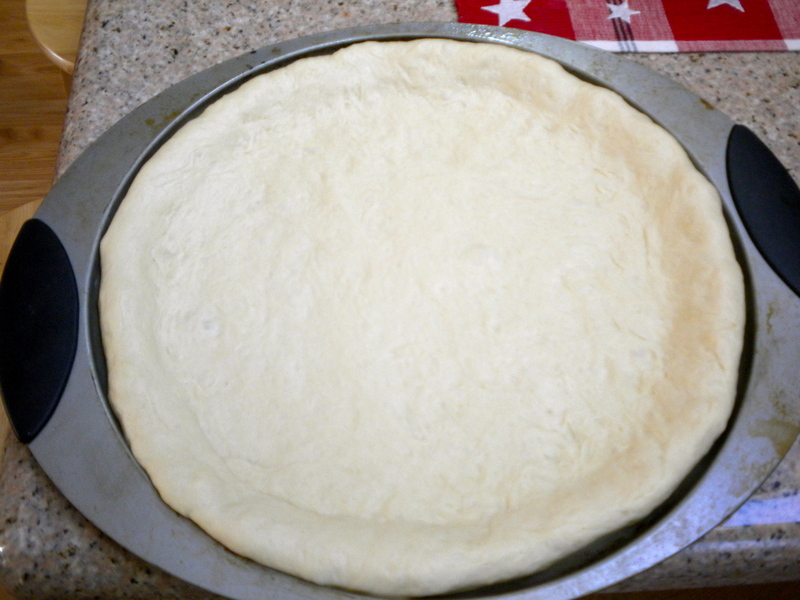 Flip the dough onto the pan so the pinched side is down. Bake the crust in a preheated 400F oven for 10 minutes. Remove from oven and add desired toppings. Return pizza to oven to finish baking for another 10 to 20 minutes, or until done. Baking time depends on size and thickness of crust and selected toppings. My mom and stepdad both tried my whole wheat pizza and said they liked it. Everyone really enjoyed the pepperoni too. The cheese did leak out in a couple places, but for the most part stayed put. The little mozzarella pearls worked perfectly for this crust. With how simple and inexpensive these were to make, I don’t want to go back to ordering in!